Toucheo is a new system that efficiently combines direct multitouch interaction and 3D stereoscopic visualization. In our approach, users interact by way of simple 2D gestures on a monoscopic touchscreen, while visualizing occlusion-free 3D stereoscopic objects floating above the surface at an optically correct distance. By registering the 3D virtual space with the physical space, we produce a rich seamless workspace where both the advantages of direct and indirect interaction are jointly exploited. In addition to standard multitouch gestures and controls (e.g. pan, zoom, and standard 2D widgets) from which we take advantage, we have designed a dedicated multitouch 3D transformation widget. This widget allows the near-direct control of rotations, scaling, and translations of the manipulated objects. To illustrate the power of our setup, we have designed a demo scenario where participants reassemble 3D virtual fragments. This scenario, as many others, takes benefit of our proposal, where the strength of both multitouch interaction and stereoscopic visualization are unified in an innovative and relevant workspace. This new system has jointly been developed by Inria (Potioc group, with LaBRI) and Immersion SAS. 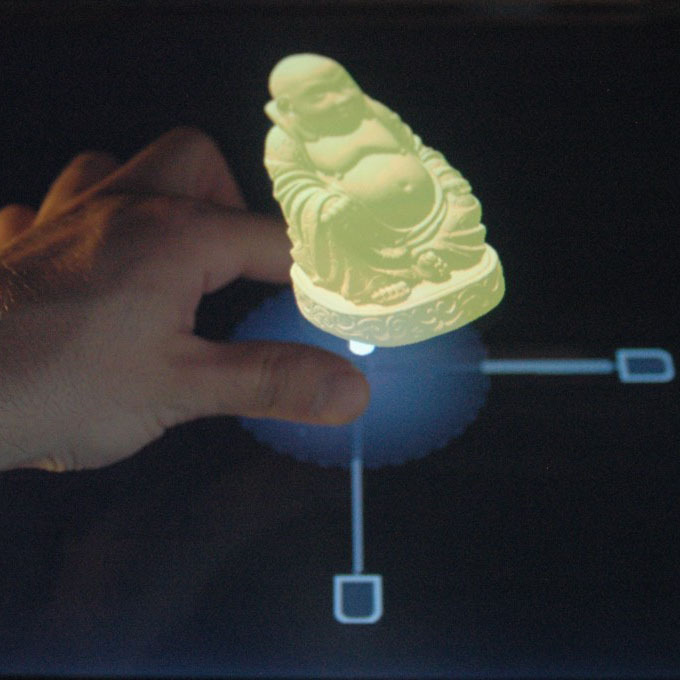 It is part of the InSTInCT project on touch-based 3D user interfaces. Martin hachet, Benoit Bossavit, Aurelie Cohe, Jean-Baptiste de la Riviere, Toucheo: Multitouch and Stereo Combined in a Seamless Workspace. UIST 2011 – ACM Symposium on User Interface Software and Technology, Oct 2011, Santa Barbara, United States. Benoit Bossavit, Jean-Baptiste de la Riviere, Toni da Luz, Mathieu Courtois, Cedric Kervegant, Martin Hachet, An Immersive Multitouch Workspace, Siggraph 2011 Emerging Technologies, Aug 2011, Vancouver, Canada.